BRUSSELS (AP) — European Union Brexit envoy Michel Barnier said Tuesday that his team is studying ways to carry out checks on goods moving into Northern Ireland in an effort to overcome a major obstacle in the negotiations, on the eve of a summit of EU leaders. Brussels and London are struggling to come up with a solution that would keep the border open between EU member Ireland and the U.K.’s Northern Ireland, just six months before Britain leaves the bloc. After talks with EU ministers in Brussels, Barnier told reporters that it’s important to “de-dramatize” the whole border issue. The goods would then move freely from Northern Ireland into Ireland and the EU. Despite suggestions of a compromise on a key issue, European Council President Donald Tusk warned earlier Tuesday that both sides could yet fail to reach an agreement. “Unfortunately, a no deal scenario is still quite possible. But if we all act responsibly, we can avoid a catastrophe,” Tusk wrote in a letter, inviting the 28 EU leaders to talks in Salzburg, Austria, starting Wednesday evening. Barnier says an EU summit in October “will be the moment of truth” in Brexit talks. 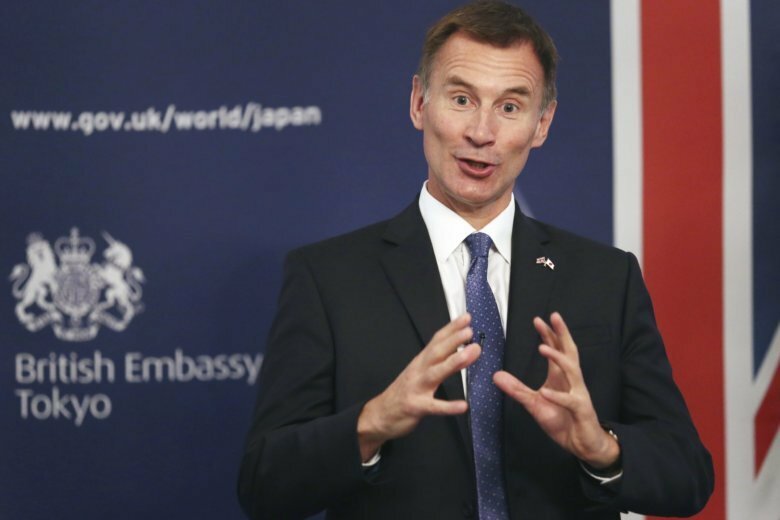 In Tokyo, British Foreign Secretary Jeremy Hunt insisted that the U.K. will flourish with or without a deal. British Prime Minister Theresa May needs to win over both the EU and critics of her Brexit proposal within her own Conservative Party. Britain is due to leave the EU on March 29, but both sides are eager to seal a deal within weeks to leave parliaments time to ratify it. Japanese companies with operations in Britain are among those worried about the impact of a no-deal Brexit, in particular on their ability to export from the U.K. to the rest of Europe without tariffs or other trade restrictions. Under a no-deal scenario, the U.K. would leave the EU without establishing rules for future trade between Britain and the 27 remaining EU member countries. “The U.K. will flourish and prosper as one of the strongest economies in the world whatever the outcome of these talks,” Hunt said, noting its business-friendly environment and strong universities. He defended the May government’s proposed Brexit deal, which has been roundly attacked by his predecessor, Boris Johnson. Hunt replaced Johnson as foreign secretary in July. “British politics is littered with the graveyards of people who have predicted the demise of Theresa May and been proved wrong,” he said. “Of course Boris Johnson doesn’t agree with some of the policy decisions that she’s taken, but Theresa May has to speak not just for the 52 percent who voted for Brexit, she has to speak for 100 percent of the country,” he added. Hunt is in the Japanese capital to hold annual U.K.-Japan strategic dialogue talks with Foreign Minister Taro Kono. Ken Moritsugu reported from Tokyo.